I really just wish that they weren’t Red versus Blue, since this column will be released on what is arguably the nation’s most contentious midterm election day in history (go vote, everyone!). On the other hand, I hate that the two-party political system has radicalized emotional responses to something as benign as primary colors. What am I talking about? It has literally nothing to do with government. 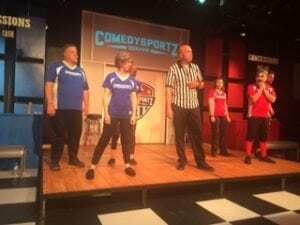 It’s just games — theater games, in the form of ComedySportz. There’s a distinct irony that is probably not lost on the group’s founders that most of their participants are not, even by the broadest of definitions, athletes. They are attractive and appealing people, but sportsball, they do not play. They’re a bunch of theater geeks with nary a heart-rate monitor amongst them. They don’t drink whey-protein recovery shakes or have a backstock of ShotBloks. I would surmise that most of them drink regular milkshakes and just do shots. Nobody has six-pack abs, but the team could kill a couple six-packs of PBR in a hurry. Their lack of athletic prowess benefits their show, though, because speaking from personal experience, it’s damn hard to be funny when running past the 21-mile mark of a marathon. The Red versus Blue rivalry unfolds every Friday and Saturday night at the Avenue Theater on 17th and Logan. It’s pure short-form improv comedy, overlayed with the sports gimmick and it works delightfully well. 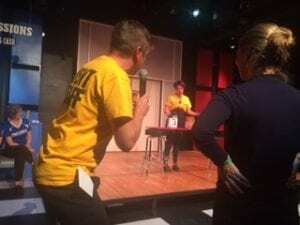 For those not familiar, “improv” is theater games played out on stage, with nothing written or prepared beforehand, working off of suggestions from the audience members. It comes in two forms: short and long, but we’ll ignore long-form for today. Short-form is the most well-known, with the famous example of Whose Line Is It, Anyway? It’s fast-paced and runs on jokes and gags and the ability of the players to abandon all dignity in pursuit of comedic gold. 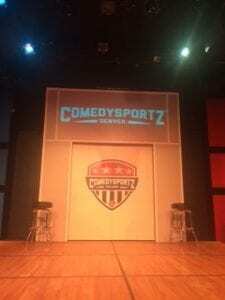 ComedySportz is distinct from most short-form in a couple ways. For one, it abandons one of the tropes of improv, that of pure minimalism. The iconic image of an improv stage is a worn wooden floor with a single battered chair in the middle of it. The players create the rest of the space with their words and actions. 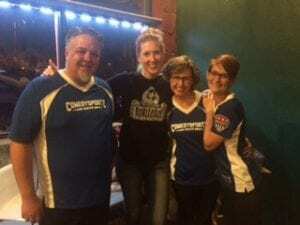 ComedySportz has the highest production value of any improv show I’ve ever seen, and that’s saying something. They have concession stands that look like giant stage props, but are actually functioning concession stands. There’s a jumbotron scoreboard and even a zamboni that comes out at halftime to smooth over the pitch. 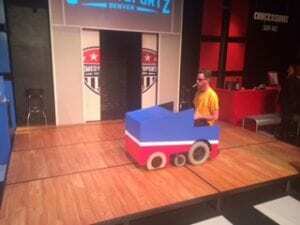 There’s some cognitive dissonance here, because wooden floors don’t have zambonis, but it’s improv and we’re all playing the game here, and so this one deserves a pass. Also, how charming is it to find a pint-sized zamboni?! I tried to figure how the mechanism works and it looks like a small motorized wheelchair with a red-and-blue zamboni-shaped shroud built around it. But how did a theater company get a hold of a motorized wheelchair? Those things cost thousands. I relish the mystery, but my dark side conjures up horrible histories to where that chair comes from, none of which are true, I’m sure, but it’s a disturbing peek into my psyche. Another distinction of this production is the sports theme. 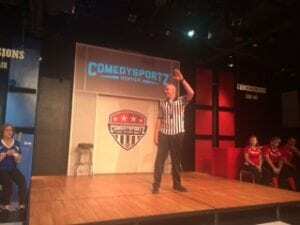 Few short-form shows embrace a specific visual or enacted theme and ComedySportz does, from the “uniforms” to the scorekeeping to the staging. The Red and Blue teams take the extremely well-manicured floor over a soundtrack of peppy, sports-y music and a moderator in a striped umpire jersey hands out the rules. It’s a family-friendly show with a “yellow flag” foul rule: if any player (or audience member) “goes blue” and uses unnecessarily crass or offensive content, they have to wear a paper bag over their head for the remainder of the game. (It’s a King Soopers bag. No idea if this is a sponsorship deal.) The ump briefly explains the game to the audience, then unleashes the players to enact it to maximum comedic effect. It’s very sports-y. Having watched and played a lot of short-form, I’ll say that ComedySportz does two things really well: musical games and Forward & Reverse. Musical games are always a crowd favorite. Humans love music and seeing players compose music based on their own suggestions delights the audience. 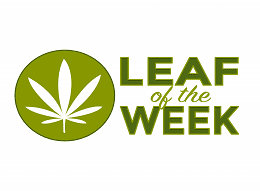 Our brains flood with dopamine and we rejoice! Also, there’s some seriously talented musicians on the teams who can show off their singing skillz. Forward & Reverse plays out with the players enacting a scene, then reversing the sequence of lines and actions when the ump calls out to switch. It’s freakin’ hard to keep the scene in order and freakin’ awesome to watch when done well. They do it well. And it’s awesome. So happy Election Day, everyone! No matter what happens, if there’s a Blue Wave or a Red Wave or just a big Purple Smear, you can find some relief in laughter and the group-think of improv just a couple days from now. Get yourself a ticket, buy some Nerds at the concession stand, watch some nerds on stage, and treat yo’self to the delight of watching the world’s tiniest zamboni smooth over the dings and divots that erupt between Red and Blue.